I have to agree with Red Parrot Fish. How could anyone but an idiot, think it's a good idea to turn the worlds deadliest roads into a playground for children? we are already up in the village for the songkran holiday. The village has maybe two days then the rest of the time its for the kids and at the temple. I don't leave the house the first two days, neither do the kids. Once the parades are done i take them up to the temple as the kids enjoy the water fights with the other kids. Pretty tame up here, which is why we come. I set myself up with internet and such years ago up here, got air con, good kitchen etc. So i don't mind coming up here for a few weeks a year. I don't know how i would do it in Khon Kaen, except just stock up on food and stay home. To many drunks on the road to even attempt to leave the house except in the early morning maybe. More than 3,000 motorists were found to be driving while drunk on the first of the so-called “seven dangerous days” of the Songkran holiday. A junta spokeswoman said on Thursday that 156 vehicles were seized the day before and 2,716 motorcyclists and other drivers were charged with drunk driving. The first three days of Songkran's “seven dangerous days’’ saw 188 deaths and 1,934 people hospitalised in 1,846 road accidents across the country. On Friday alone, the Songkran Day, there were 820 road accidents, claiming 86 lives and hospitalising 852 people, Pol Maj Gen Ekkarak Limsangkat, commander of Special Branch Police 3, said on Saturday. This brought the accumulated death toll from April 11 to 13 to 188 in 1,846 accidents, which also injured 1,934 people. Drink-driving remained the major cause of the crashes (47.6%), followed by speeding (27.4%). Most of the accidents (78.9%), involved motorcycles, said Pol Maj Gen Ekkarak. [/color]At 2,029 checkpoints nationwide, 172,294 people faced legal action for traffic law violations. Of the total, 50,197 failed to wear crash helmets and 45,485 drove without licenses, said the Special Branch Police 3 commander. [/color]Meanwhile, a total of 113,960 people were found to have violated the anti-drink driving measures over the past three days, with 2,991 vehicles impounded, National Council for Peace and Order and army spokeswoman Sirichan Ngathong said on Saturday. 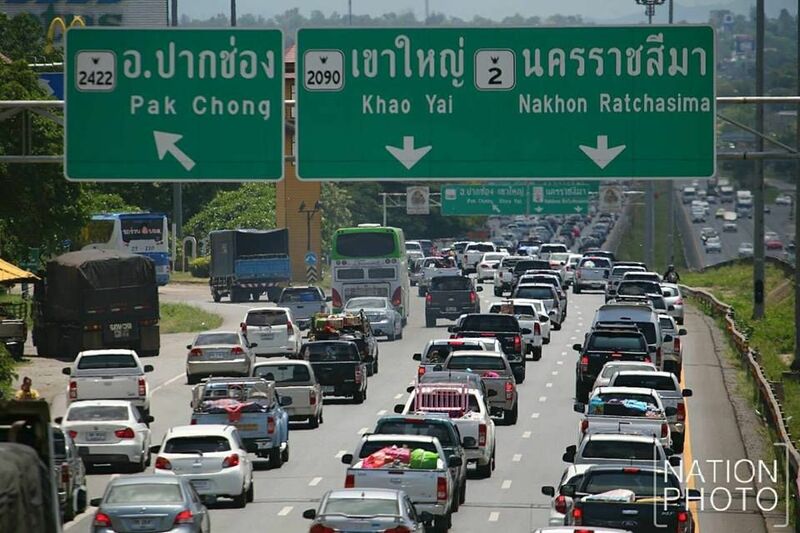 Fifty-seven people were killed and 626 injured in 603 road accidents nationwide on Saturday, April 14, the fourth of the "seven dangerous days" during this year's Songkran Festival, raising the road toll between April 11-14 to 248 deaths and 2,557 injuries. Dr Opas said there were 603 road accidents throughout the country on April 14, killing 57 people and injuring another 626. The biggest cause of the accidents - 43.62% - was drunk-driving, while another 25.70% were attributed to speeding. As usual, the majority of the accidents - 79.58% - involved motorcycles. The accumulated number of accidents during April 11-14 was 2,449, causing 248 deaths and 2,557 injured. In a separate press conference, Col Sirichan Ngathong, deputy spokesperson of the National Council for Peace and Order (NCPO), said that over the past four days police impounded 7,067 vehicles (5,019 motorcycles and 2048 cars) for violating the alcohol ban, seized a total of 16,588 driving licenses and took legal action against 82,598 drivers of motorcycles and 47,327 drivers of private vehicles and public transportation. It is amazing how dumb the mind is! I always take the Songkran numbers at face value without comparing them to non-Songkran numbers. Steeve, assuming your figures are correct, 24,000 / 52 weeks = 462 road fatalities every week! Sigh! This brought the accumulated death toll from April 11 to 15 to 323. Another 3140 were injured in a total of 3,001 road accidents. Drink-driving was stated to be the major cause of the fatal crashes (42.03%), followed by speeding (25.72%). Motorcycles were involved in the highest number of crashes (78.53%), said Mr Damrong. People aged over 50 accounted for 23.25% of the road deaths. 178,191 traffic offenders were arrested at 2,031 road checkpoints, including 51,488 motorcyclists without crash helmets and 46,094 people for not carrying a driving licence. Stevve,don't know where BBC got their statistics but here is another set of numbers that don't quite match up to yours. Sorry Stevve but your statement that the ones that die on the way to or in hospital are not counted is incorrect. Day 1 first report was that there was 39 deaths that is what was a direct figure from deaths at the scene but that number was updated to finish at 48 deaths for day 1 because the other deaths were from hospitals when the person died from injuries from an accident from day 1 for the whole 7 days the deaths have been updated on a daily basis as people died in hospital but now that day 7 has passed anyone who dies in hospital from any accident between day 1 and day 7 does not go onto the count for the 7 days. Here is the totals at the finish of the 7 days there were updates of the deaths for the first 5 days but there has been no updates since. The statement by asiancorresponent.com is incorrect. Read your news reports from Bangkok Post, The Nation and Pbs Thai and you will see that the reports on day 1 for day 1 lists 39 deaths and then on day 3 it updates the figures for day 1 and now the deaths are 41, that is 2 more deaths that did not occur at the scene of the accident but did occur in the hospital and then on day 7 it updates to the final figures as 48 deaths on day 1. So from day 1 to day 7 the deaths for day 1 has increased by 9, those 9 died in hospital not at the scene of the accident.